I have been experimenting with pizza doughs lately. I have found the following basic recipe to be a good one to use for homemade pizza. It can be tweaked by adding spices if desired, as well. That is one reason I like it so much. I use my bread machine to mix the dough for me. Otherwise I would never have homemade dough! I just cannot do this sort of thing with my arthritic hands anymore. If you use your breadmaker and it has a pizza dough setting, use that. If it just has a dough maker setting, this is a 1 and a 1/2 lb recipe. My pizza dough setting does not give an option to set the size like some of the other choices do on the machine. NOTE: I had to add almost 1/4 cup extra water because it was a little dry today…sometimes I do not have to add anything, I guess it is a humidity thing?? ?…if it does not form a ball with the entire mixture soon, start adding water just a TABLESPOON or TWO at a time until it forms a ball. If it gets too sticky, just sprinkly LIGHTLY with bread flour and this should correct that problem. The breadmaker should handle the work from that point on. I rolled the crust above out on wax paper instead of the counter, just so I would have less to clean up afterwards. I dusted the surface of the paper with bread flour and put the dough in the center of it. Making sure the dough was dusted all the way around with flour, I worked from the center outward. 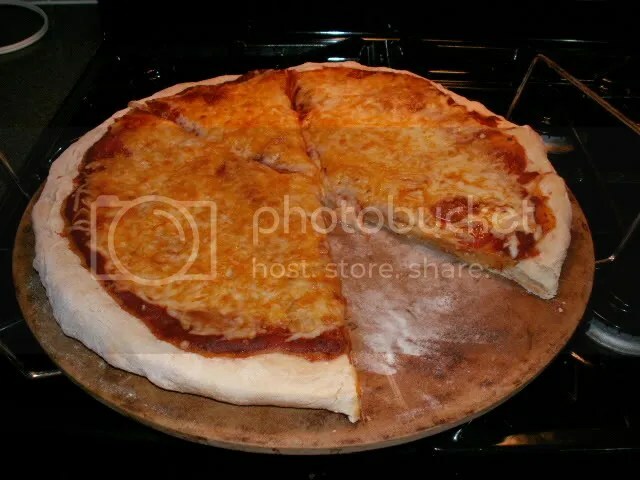 I use a Pampered Chef pizza stone to cook pizza. I lightly coat with olive oil, then dab it off with a towel to make sure it wont go over the edge when the weight of the dough is added. 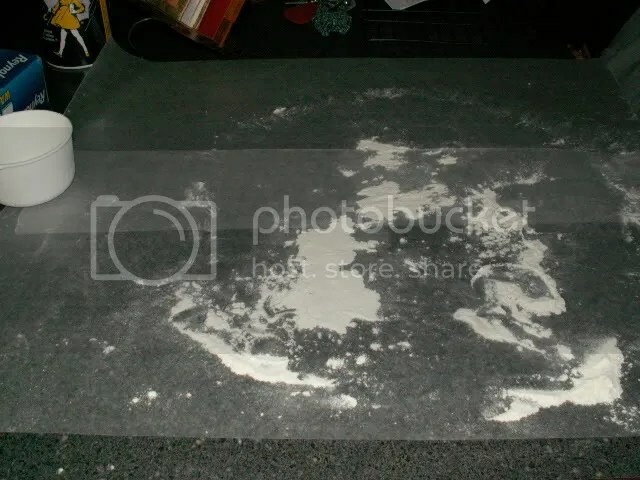 After I removed the dough, I carefully folded the top paper so that none of the flour went onto the counter, then the same for the second sheet…then threw it away. 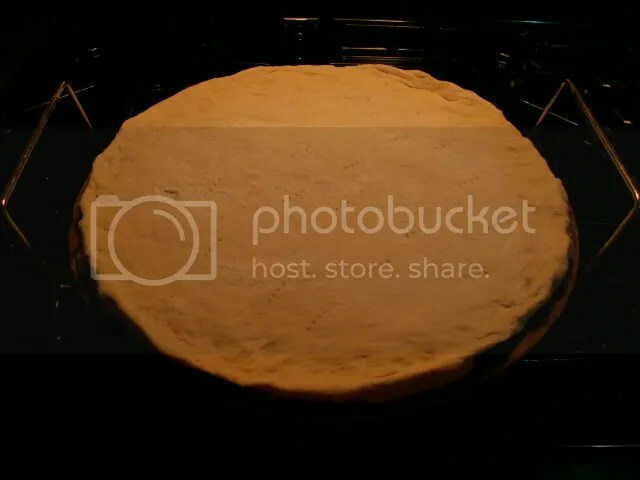 Bake pizza dough at 350 degrees for about 10 minutes. 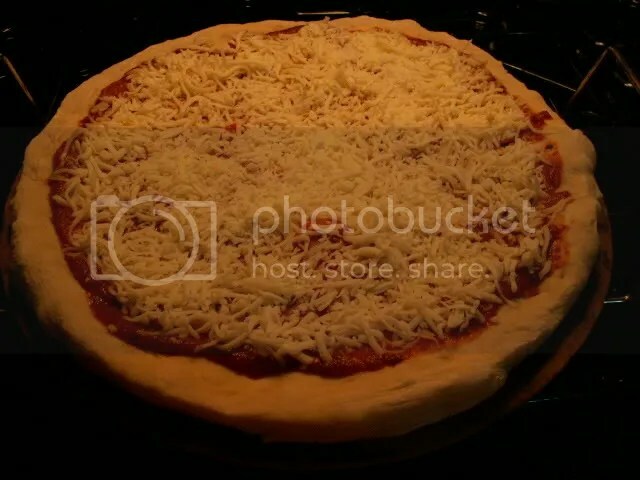 The point is to cook it partially before adding toppings so it will not get soggy and will be fully cooked when the top of the pizza is ready. Add sauce and toppings as desired. Puree the whole tomatoes in blender then pour in medium saucepan and add the spices and garlic. After bringing to a boil, taste test to see if more spices are needed. If so, add more until you like the taste. Cook until a thick consistency for spreading on the crust. Bake at 400 for approximately 20 minutes, but check the pizza at about 15 minutes in case it gets done sooner. Ovens may vary. Mine took slightly longer, but I have to cook mine slightly lower due to oven settings needing adjusting. I also recently made a barbeque chicken pizza using Sweet Baby Ray’s BBQ Sauce, Hickory Smoke flavor, I think it was called…I usually prefer the original, but I picked up the wrong bottle out of the fridge. It was actually delicious! I cooked chicken breasts in the pressure cooker just covered in water and seasoned with onion flakes, sea salt and a little garlic powder, until it was so tender it was nearly falling apart. Then I took it out of the broth and cut it up in a bowl. I saturated it with the BBQ sauce and set it in the fridge for later use. Next, I made my pizza dough (the pizza dough cycle on my machine takes 55 minutes). After preparing the crust just like above, I used more of the BBQ sauce and spread the chicken around the crust. I topped it with mozerella cheese and baked just like pizza above. YUM!!!! Spread oats in a shallow baking pan and bake in 350 degree oven for 15-20 min or until lightly browned. Stir occasionally and check often in case they brown sooner. Cool slightly. 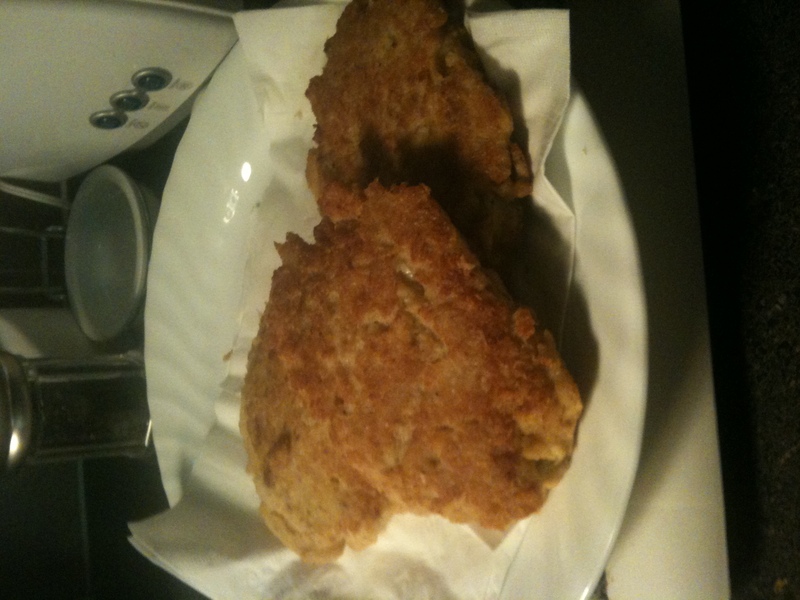 In bread machine, add buttermilk, then honey, then butter, then flour, then oats, then salt, then active dry yeast. 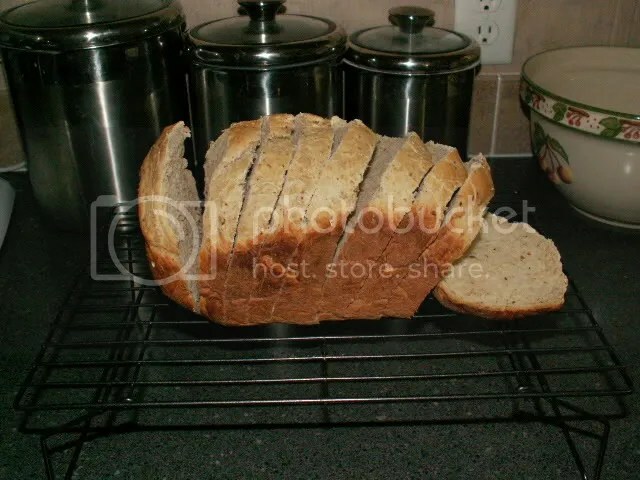 Use basic white bread cycle for 1 1/2 pound loaf if your machine does not have a whole grain cycle. I set my crust level on light and it turned out perfect. *If your loaf appears too wet, add up to 1/2 cup bread flour depending on your altitude. 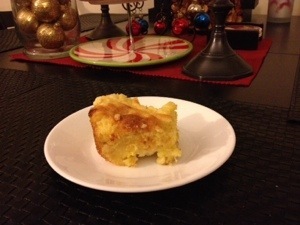 This recipe works perfect at just over 2,000 ft above sea level where I live.